Piedmont Plastics started as one of our awesome vendors! When they saw how we were using their products to create remarkable experiences for our clients, they knew our relationship could be something special. 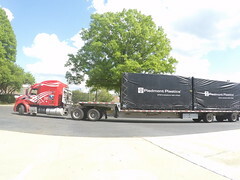 They needed a multi-functional space that could act as a traveling trade show booth and a show-room at their Charlotte location. So, we put our heads together to design a space that showcased the versatility and beauty of their products, provided them a private meeting area, and would make a splash at their upcoming expo. To check all their boxes, our team designed and built a gorgeous structure erected from two purpose-built units. Every element of the structure (apart from the steel frame) is a Piedmont Plastics’ distributed product; from the wall panels to the material used in their staircase. 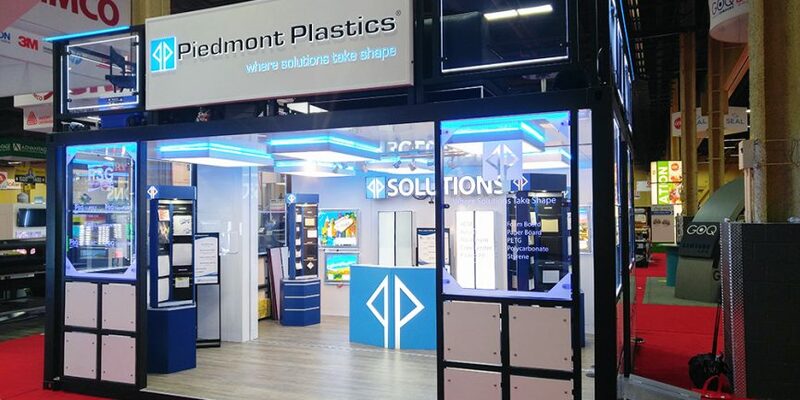 We utilized samples and retail-sized pieces to demonstrate the adaptability and stunning visual impact of Piedmont Plastic’s inventory. Inside the container, beautiful displays gleamed from their strategic lighting and artistic use of materials. Upstairs, on their deck, they held meetings and one-on-one conversations. At the 2017 ISA Sign Expo, their first activation, the booth was a hit! The modern look and ethereal glow, drew in tons of people to explore, take photos, and talk to Piedmont Plastics’ representatives. Walking away with nearly triple their expected leads, both Boxman Studios and Piedmont Plastics can chalk this one up as a success! Stay tuned for information about new activations!